Acer Swift 7 Laptop Review: TE Award 2017 Winner. The words thinner, lighter and faster are some of the known words which we usually come across when it comes to the brand name, Apple. For the past couple of years, Competitors have tried their best to match those borders created by the tech giant. So challenging that point, Acer joins the territory of being the thinnest ever Ultrabook series by the company: winning themselves the Taiwan Excellence Award for the category. This exact laptop will be showcased at the upcoming Convergence India 2017 event, Speaking of which, I got an early glimpse of the product & Here are my initial thoughts regarding the Acer Swift 7 - The Thinnest Laptop to this date. Acer Swift 7 Review: Wins the TE Award 2017. 13 inch IPS LCD with 1920*1080 HD Resolution. 1.2 GHz Intel Core i5 (7th Gen) Processor with 8GB DDR3 RAM. 256GB SSD with no optical drive support. It comes with WiFi, Bluetooth, 2 x USB 3.1 slots & a touchpad for connectivity. Provides up to 9hrs of backup & has a four cell Lithium-ion type battery. For the Audio, It comes with Dolby Audio and Acer True Harmony support. Ultrabook weighing 1.1 KG & 0.39 inch thick which is astounding. The first sticking appeal when hold it would be, How thin the laptop is! It is one of the best-designed laptops I've ever seen & So will be your case, once you hold it. The Matte black aluminum body gives it a nice overall feel complementing the design of the Acer Swift 7. 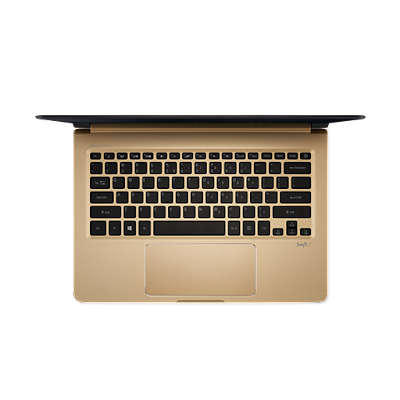 The combination of the gold inner surface and matter exterior coupled with the chamfered edges just exudes premium ability from every corner or angle. It joins the league of being slim around the 12-inch MacBook & HP Spectre series. It's due to the spacing between the keyboard & the screen which stands as a high point in the design department. The same lightweight appeal feels solid when it comes to content creation as you won't feel the laptop heavy when kept on your laps or knees. You don't even need to worry about any flexing issue at all; just in case you're worried. 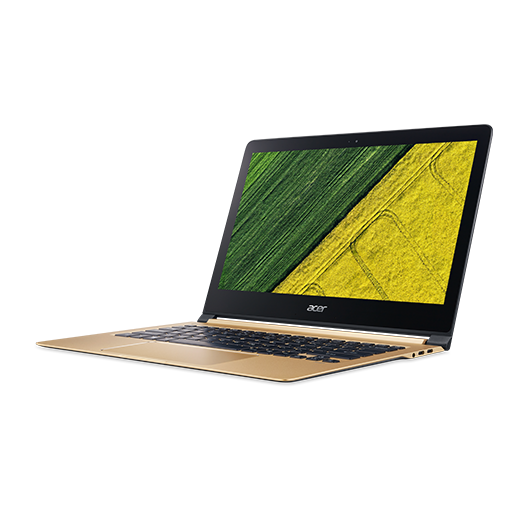 The design is not only the segment where the new Acer Swift 7 touts to excel at its best, As processing adds up as a major point in its alley. 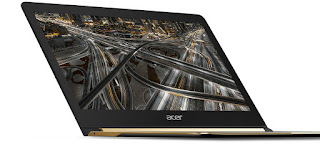 Acer has gone ahead with the new Intel Core M series processor, which is an energy efficient chipset. Your day to day tasks which include content creation may that be photoshop, writing or editing videos on the Adobe suite would be a breeze. The same is also said well when it comes to the benchmarks; Results are quite decent for a laptop which is lightweight and something which goes toe to toe with the 12-inch Macbook & HP's Spectre series. The performance is in regards to the SSD speeds which helps in achieving better read and write speeds. The added 9hrs of battery life, support for 2×2 802.11ac WIFI with MU-MIMO is a bonus. 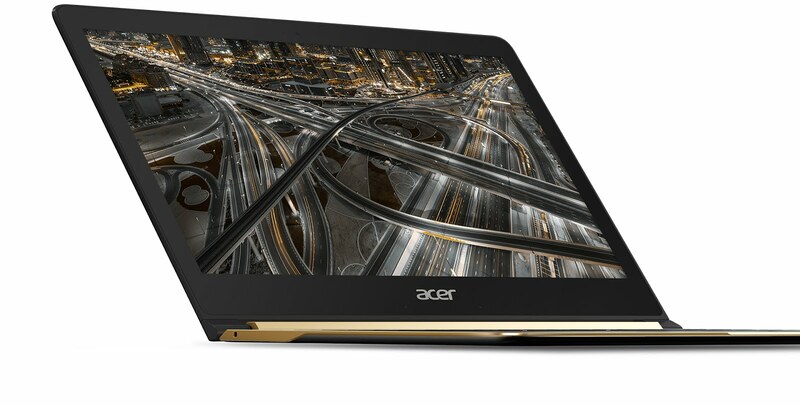 Whether it's the slim form factor or the thinnest design, Acer surely has challenged the status quote with the Swift 7 series ultrabook. The particular reason made it's debut in the Taiwan Excellence Awards chartering them an award for the design appeal of this ultrabook. Whereas TE would be showcasing their best picks from the tech world with over 100 products at Convergence India 2017. Convergence India 2017 is a nationwide event which houses the latest glimpse of the tech world from Telecom, Broadcast, Cable and Satellite TV, Cloud & Big Data, IoT, Digital Homes, Mobile devices, Film and Radio, Content Creation, Management, and Delivery, etc. On top of that they also house sessions from the leading leaders guiding the IOT industries. So make sure to visit them here & have an in-depth info about the schedule. *This is a sponsored post*.